Every sector faces unique challenges in the transition to sustainability. Across each, materials will play a key role. That will depend upon novel materials and processes, but these will only be effective with a solid understanding of the trends in the market. For each respective sector, these sessions will explore the trends and drivers toward sustainability, the enabling materials technologies and challenges, and the tools to evaluate their implications. Mobility is a ubiquitous need, but creates ubiquitous burden. Materials will play a central role in the transition to sustainable transportation – vehicles with fewer burdens in production, use, and disposal. This session will explore the challenges, trends, and novel approaches to realizing sustainability in this sector. Society depends upon infrastructure. Whether it be an individual home, a road network, or a pipeline system the performance of that infrastructure is governed by materials. Clever materials solutions will be required to bring modern standards of built environment to a growing and increasingly affluent globe. This session will explore the challenges, trends, and novel approaches to realizing sustainability in this sector. Modern technology – in the form of the devices we interact with and the networks on which they depend – has transformed every aspect of life, but depends on environmentally intensive processes and materials. These sessions will discuss the emerging technologies and approaches to create EEEI with fewer burdens in production, use, and disposal as well as the manner by which EEE is enabling more sustainable systems throughout the economy. A key challenge in this domain is characterizing the impact of the network and identifying solutions to address that impact. Possibly the greatest challenge of this century will be to satisfy the demand for energy without overtaxing ecosystem services. Materials solutions will be required throughout the energy ecosystem – production, distribution, and storage. Furthermore, novel materials technologies will play a central role in checking the world’s appetite for energy. These sessions will probe the synergies between system design, evaluation, and materials technologies to create a truly sustainable energy system. A population inexorably approaching 10 billion will tax the planet’s ability to provide safe, clean water. Materials are both key enablers of low cost water sanitation and water supply, but are also great consumers of water resources. These sessions will explore the coupling of materials and sustainable water supply, bridging the challenges of both supply and demand. The benefits of novel materials solutions depend on technologies that win and form in a manner which is practical, economical, and environmentally benign. This will require innovations ranging from fundamental understanding of process physics to the practical creation of ingenious tools and equipment. These sessions will examine these innovations translate materials potential into material benefit. Few imagine that sustainable production and consumption will be possible without more effective repurposing of those metals and materials we use today. 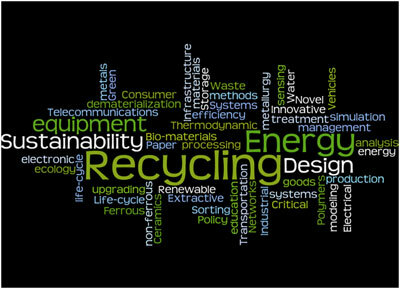 Achieving this requires innovations in a) the technologies of recycling and recovery including sorting, upgrading, and reprocessing; b) the design of complex recovery systems; and c) the design of materials and products that are more readily recycled. Revolutionizing materials technology requires models that will allow us to rapidly scan for truly novel solutions. Ultimately, this will require models that span from the atomistic through the meso-scale of grains and structure to the macro scale of design. These sessions will examine the strategies to make this possible, the challenges that remain, and the ways in which these tools point to more sustainable materials systems. Materials choice impacts the entire life cycle of products and services, from the impact of extraction, to processing technologies and use profiles, all the way to end of life fates. Employing industrial ecology strategies to dematerialize products and services, substitute with lower impact materials or mine useful materials at end of life all require dedicated understanding of the role of materials. These sessions will explore the use of life cycle management & analysis and other simulation tools to inform how society might move towards more sustainable systems. Ecosystems, metropolitan regions, and supply chains are examples of complex entities where small changes within one component can have cascading impacts throughout the entire system. These sessions will show how modeling approaches that provide insight into whole systems enable deeper understanding of potential levers towards sustainability where non-intuitive behavior may arise due to the vast complexity. One of the most challenging and critical aspects of realizing a more sustainable society is influencing consumer behavior towards concepts such as improved efficiency, collection rates at end of life and adoption of improved technologies/ products. Furthermore, we must provide the future materials community with the tools to take on the challenges of sustainability. These sessions will describe innovations in education towards training future sustainability-aware engineers and scientists and understanding ways to make us all more sustainable consumers.